The National Executive of the Confederation met on 13th September, 2009 as notified. The meeting commenced after observing two minutes silence in memory and to pay homage to Shri Y.S. Rajasekhara Reddy, Chief Minister of Andhra Pradesh who died in the Helicopter accident and to all those comrades who passed away during the interregnum period. The decisions taken at the meeting agenda-wise are as under. (a) National Council meeting and related issues. The Secretary General had reported that the tenure was to end by September, 2009 and the next Conference must be held within the next three months as per the provisions of the Constitution. The meeting considering the report of the Secretariat decided to extend the tenure of office by three months. The triennial National Council meeting will be held on 4th,5th and 6th December, 2009 at New Delhi. The inaugural session will commence at 2.30 PM on 4th (Friday) and shall be concluded by 6.30 PM. Business session will commence on 5th at 10.30AM and the conference will be concluding its deliberations on 6th by 5.30PM. The inaugural session will be participated and addressed by all the Central T.U. representatives, all affiliates of the TUI-PAE in Indian Sub-continent, Sri Lanka, Japan and Vietnam. The TUI General Secretary will also be invited to address the inaugural session. The Secretariat will interact with the COC Delhi to form a Reception Committee and work out other details. The National Executive after deliberations decided to place the following amendments to the Constitution. The management of the Confederation shall be vested in the following bodies. (a) The National Conference, which shall meet once in three years. In exceptional Circumstances, the tenure may be extended by three months by the National executive. (b) The National Council, which shall ordinarily meet once in a year. (c) The National Executive which shall meet at least once in four months. (d) The Secretariat (which shall consist of office bearers and the elected executive committee members) shall meet as frequently as considered necessary (with the available members at the CHQ and those who can attend the meeting at short notice) to discuss important and urgent matters. The National Conference: Powers and duties: (as is prescribed in the extant provisions of the constitution pertaining to National Council). Composition of the National Conference. For every 10000 members exceeding 50,000 one additional delegate for every 10,000 members subject to a maximum of 20. The expenses of the delegates/Councilors/NE members/Office bearers shall be borne by the respective affiliates of which he is a primary member, except of the President and Secretary General. The expenses of the President and Secretary General will be met out of the funds of the Confederation. Article 14. will be replaced with the following. The National Council, Powers, function and composition. (c) The Secretaries of all State COCs who have paid Rs. 5000/- p.a as subscription to the Confederation CHQ. Powers, functions, duties and composition of the National Executive. Other affiliates having membership strength exceeding 5000 = one each. (b) Voting in National executive.= Each members shall carry one vote. It was decided that the Secretariat should once again circulate the details of membership of each affiliated Association/Union (as declared earlier) and permit them to correct the declared membership and pay the arrear dues. Payment of subscription dues will be received by the CHQ up to 30th October, 2009. The number of delegates on the basis of the paid up membership to be assigned to each affiliate will be notified by 10th November, 2009. The resolution adopted at the meeting after discussion is annexed. The following programme of action has been decided to be carried out. (i) to organize meetings in front of all offices and other campaign programmes like issuance of leaflets etc. to popularize the following demands and adopt the resolution demanding the convening of the Departmental Council of the respective Ministries/Department. This should be carried out by all affiliates and its units and branches during September and October, 2009. The resolution adopted in this regard to be sent to the concerned Secretary of the respective Ministries/Department with a copy to the Confederation CHQ. (ii) To organize a human chain on 25th November, 2009 in all Cities/Towns by eliciting massive participation of the members. The human chain should preferably connect two Central Govt. offices as is chosen by the concerned COCs. The human chain is to be organized to project the following demands as detailed in the annexed resolution. (a) To reduce the price of all essential commodities. (e) To rescind the decision to replace the CGHS and Medical facilities by Medical Insurance scheme without causing any discussion in this regard with the Staff Side. (f) To restore the Departmental Council functioning in all Ministries/Departments and ensure that the meetings of the Councils are held once in every four months. Convene the meeting of the Anomaly committees to discuss and settle the issues. (e.) Reporting of the Conference of the TUI PAE held at Brasilia. The Secretary General briefly reported of the proceedings of the TUI Conference held at Brasilia in Brazil. The house noted with appreciation that the Secretary General of the Conference has been elected as the Vice President of TUI- PAE. (f.) 14th September, TU Convention. The meeting decided to depute the following comrades to attend the Workers Convention organized jointly by all the Central Trade Unions in the country. The meeting also decided to carry out the programme chalked out by the Convention. Com. S. K. Vyas. President, Com. K.K.N. Kutty. Secretary General, Com. M.S. Raja, Secretary and Com. K.Raghavendran, Secretary General, NFPE. Copy of the declaration adopted at the Convention is annexed. Please ensure that the representatives of the COCs participate in the State level convention of the workers and the protest day programme slated for 28th October, 2009. (g) Any other matter with the permission of the Chair. It was decided that the Confederation will write to the Cabinet Secretary, on (i) the non functioning of the JCM fora (especially the National Council, Standing Committee and the National Anomaly Committee) (ii) to the Director CGHS to restore the emergency consultation facility in CGHS dispensaries and (iii) to place the copy of all important correspondence with the authorities on the website of the Confederation. Resolution adopted at the National Executive Committee meeting of the Confederation held at New Delhi on 13th September, 2009. The National Executive of the Confederation which met today on 13th September, 2009 unanimously adopted the following resolution. ii) While issuing orders to pay 60% of arrears on account of revision of pay it has been stipulated that in the case of those employees recruited after 1.1.2004 that the same should be paid only after obtaining the application for registration to NPS. This is not only uncalled for, but also an illegal condition, which should be withdrawn. iii) There has been unprecedented rise in price of all essential commodities which has severely reduced the purchasing power of the workers/employees income. It has affected the common people to the brink of extreme poverty. The meeting noted that the incessant rise in inflation of food articles is due to the following policies of the government and demand reversal thereof immediately. (e) failing to ensure self sufficiency in the production of a range of crops, including cereals, sugarcane, pulses and oil seeds, thus causing shortages, high prices and dependence on imports. In the light of the above, the National Executive has decided to call upon all affiliates and their members to organize the following programme of action. It also direct the Secretariat to convey to the Cabinet Secretary, the discontent and agitation of the employees and demand settlement of the issues immediately. Move the Govt. for disinvestment of shares in profit making Central Public Sector enterprises. Steps are taken for removal of all restrictive provisions bases on poverty line in respect of eligibility coverage of the schemes under the unorganized workers social security Act 2008 and creation of National Fund for unorganized sector to provide for a National Floor level Social Security to all unorganized workers including the contract/casual workers in line with the recommendation of National Commission on enterprises in Unorganized Sector and Parliamentary Standing Committee on Labour. Disinvestment of shares of Central Public Sector enterprises (CPSEs) is not resorted to for meeting budgetary deficit and instead their growing reserve and surplus is used for expansion and modernization purposes and also for revival of sick public Sector undertakings. To observe All India Protest Day on 28th October, 2009. The National Convention calls upon the workers and employees and their unions irrespective of affiliations to unitedly highlight their concern over the above mentioned burning issues facing them. The Convention also appeals to them to participate in the joint programmes of the trade union en masse to press for the above mentioned demands before the govt. 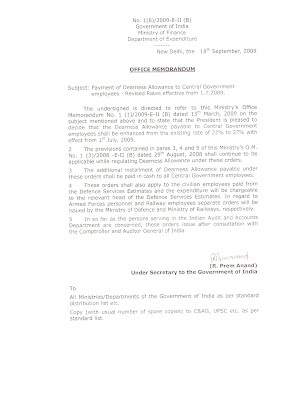 Copy of Confederation's letter dated 25th August, 2009 addressed to the Secretary, Expenditure, Ministry of Finance, Govt. of India. Sub: Implementation of New Pension Scheme. Pre condition for release of 2nd instalment of arrears of 6th CPC recommendations. We solicit your kind reference to the O.M.No. 1(2) E.V/2008 dated 17th August, 2009 on the above subject. It has been stipulated in the said order that the release of 2nd instalment of 6th CPC related arrears (60%) in the case of employees who are covered by the new contributory pension scheme would be subject to their filing application for registration to NPS. We feel that the payment of arrears being mandatory to all Central Government employees as and when the Government takes decision to release funds, the condition stipulated in the above cited order is not only uncalled for but also untenable. Irrespective of the fact whether they would like to subscribe to the new scheme of pension or not, the amount of contribution is being deducted from their salary every month, even though the PFRDA bill is still awaiting assent of the Parliament. We, therefore, request that the above cited order may kindly be caused to be withdrawn. Copy of Confederation's letter addressed to the Director, CGHS, Nirman Bhawan, New Delhi. Dated 14th September, 2009. It has been brought to our notice by our affiliated organizations that direction have been issued by your office to the CGHS dispensaries located outside Delhi to discontinue the emergency CGHS facilities in those towns/Cities. This direction has put the beneficiaries to insurmountable difficulties. Consequent to this decision the patients with minor health problems but require urgent medical treatment are to go to Govt. hospital, and incur expenses on medicines etc. They are then to seek reimbursement thereof which involves procrastinated procedural formalities. Besides causing avoidable inconvenience to the beneficiaries this new procedure adds only additional work burden at the field offices of CGHS . In any case, withdrawing existing benefit especially in the background of the introduction of an increased subscription rates is not desirable. We, therefore, request you to kindly restore the emergency CGHS facilities at all the existing dispensaries. Placed hereunder are the photos depicting the view of the audience at the National Convention of Workers held at Mavalankar hall on 14th September, 2009 at New Delhi. The Second photograph is of the Confederation delegation consisting of Com. S.K. Vyas, Com. K.K.N.Kutty, Com. M.S. Raja and Com. K. Raghavendran attending the convention.